Unrepentant but revived Zimbabwean badboy Rockford “Roki” Josphats has dumped his dancer wife Melody “Choco­late” Musekiwa two years after the two moved in together. The two have a one-year-old baby girl named Dawn. While many thought that the bed-hopping father of five “official” children had turned the corner, the singer is said to have returned to his old bad habits. Insiders say the artiste, who has been “bedding” other women in front of Melo as Melody is affectionately known, was set to move out of their Waterfalls home last week, leaving the dancer to care for their toddler. dancer wife Melody “Choco­late” Musekiwa. The sources said it was a pity that Roki was now leaving one of the only people who stood by him during tough times. “When the chips were down and no one was around for Roki, this girl was there. All the pretty girls had run away because Roki was struggling to make ends meet, now that things are better, he dumps her,” said a source close to both Roki and Melo. Before Roki went to Big Brother he hardly held shows and was living off pit­tances from recording underground artistes. His children were staying with his mother in Seke communal areas while the few shows he held would flop time and again. It is during that time when his life had shrunk that Roki started co-habit­ing with Melo and their union was blessed with a baby girl. He even confirmed then, in an inter­view with this publication, that Melo had been with him through “thick and thin”. “Melo is a sweet girl and has been with me through everything. When the last woman in my life threw me out of her life, I decided to move on. Suddenly I realised that I only had Melo beside me and every­one else was gone,” he said at the time. He even went on to name his daughter Dawn, saying because she signalled the beginning of new things — “she is like the bringer of light, hope and a new day”. He later represented Zimbabwe in the Big Brother StarGame where even though he flopped, he came back rejuvenated to resuscitate his waning music career. Last week, the 27-year-old super dad confirmed that his relationship with Melo had irretrievably broken down, but was quick to add that she would continue working as one of his dancers. Said Roki: “I have good relationships with all my baby mamas and, as you know, I have a perfect mutually beneficial work­ing relationship with my first wife (Pauline Gundidza). This will be no dif­ferent, Melo and I will continue working together in the band so that she can take care of her­self. On the issue of moving out of the house he was staying in with Melo, the baby and his cousin Discord, Roki said the move arose out of the need to strategically posi­tion his studio. “The place we have been operating from was not good for business. We are moving to a place that is by the road in Mainway Meadows and that should be strategic for the studio. In the meantime, I will be liv­ing there, but I intend to move to different place later on,” he said. The super dad, sometimes also referred to as the Evil Genius, vowed to ensure that Melo would have a roof over her head. How­ever, Melo, the latest of Roki’s victims, was by Thursday still frantically trying to secure accommodation. “Who told you about this?” asked Melo, before threatening to hang up the phone. However, she later warmed up and opened up on what she called her “four months in hell”. 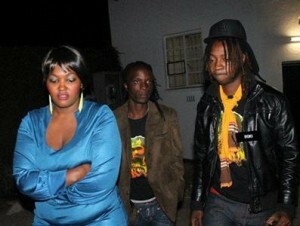 Roki was evicted from Big Brother on June 19 but came back to Zim­babwe two weeks later. “Ever since Roki returned from Big Brother, things have not been the same at home. He just started accusing me of a lot of things and was never as nice as he was before he left. After a little while, he started dating girls that I know and doing stuff with them even in my presence,” complained Melo. She said the singer’s actions denigrated her as a wife and it made their friends and colleagues despise her. “He has been embarrassing me in front of our friends. I think it’s the Big Brother fame that is causing this. When he went to Big Brother, he was a loving husband and father, now life seems to be all about him,” protested the dancer, famed for her waist wriggling and raunchy dance moves at her estranged husband’s shows. Melo said she just wished there was something else she could do to take care of herself and her baby besides dancing. “It is sad because I have to stick around someone who has hurt me badly. I have no choice because I need to keep on danc­ing for him so that I can have a roof over my head and food and clothes for my little baby,” said Melo. Roki maintains that there is nothing wrong with the breakdown of his mar­riage with the dancer. “I have been called a lot of names and things in my life, but I have been very responsible lately. I actually believe I changed for the better because, unlike my previous splits, this one has been less dra­matic. “You see, when adults break up, it is dif­ferent. We have been living under the same roof and she is the one who takes care of all of my children. There is no way I can let my children be homeless or go without food. So I will ensure that they are all safe, including Melo,” said Roki. The Chidzoka hitmaker would not divulge why they had parted ways or whether he had paid lobola for the dancer, preferring instead to talk about his upcoming DVD album and single titled Zuva neZuva to be released soon. Melo, however, confirmed that Roki had never bothered to “solidify” the rela­tionship by paying lobola. Roki owns state-of-the-art studio equip­ment and PA system. He has officially fathered five children with three different women, but unconfirmed reports put the number of his offspring at about 10. He is such a typical mankind. mmmmmhhhh... build them and they will sure dump you in the next bin they find. Sorry sister just wait for him when he climbs down the ladder. Which woman in their right man would get with this filthy looking geezer#spit!!! Which woman in their right mind would get with this filthy looking geezer#spit!! !